The HEARsmart-sponsored Musicians for Hearing Gig held at the Gasometer Hotel on Sunday 23 August attracted a large crowd that came to see performances by local Melbourne music industry luminaries such as Fraser A Gorman, Alta and Lanks. 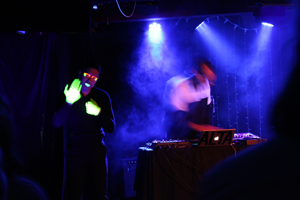 Donning fluorescent gloves, Musicians for Hearing also featured Auslan interpreters and deaf consultants from Auslan Stage Left who got up on the stage and visually expressed the music and the vibe of the night for those audience members with hearing loss (pictured above right). More than $4,000 was raised by the gig that will be used to help a Cambodian-based charity run a clinic that provides support for thousands of adult and children with hearing loss living in abject poverty. 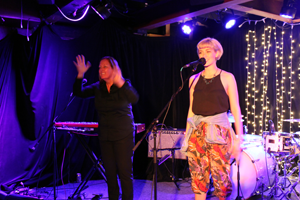 As part of 2015 Hearing Awareness Week celebrations, Musicians for Hearing was organised by clinical audiologist Siobhan McGinnity (pictured above left on the mic), who is also a HEARing CRC PhD student. Her PhD research is looking at ways to make live music venues healthy hearing environments for musicians and music lovers a like. Hopefully, Musicians for Hearing will be the first of many gigs that will continue to help raise awareness of the risk to acquiring noise- induced hearing loss and encourage and how to have better hearing health. 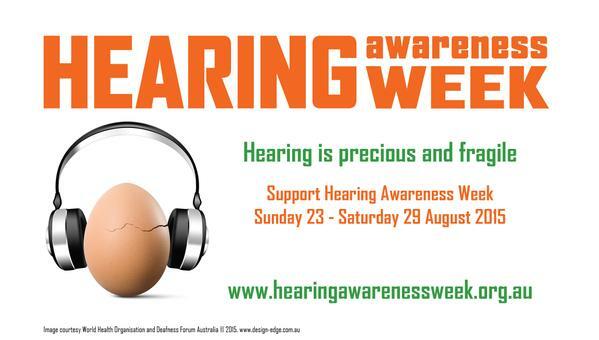 Musicians for Hearing was also proudly sponsored by Australian Hearing, The Deafness Foundation and Vicdeaf. To see more photos of the Musicians for Hearing Gig, go to the HEARsmart Facebook page.